Rubber tyre castors of 200mm diameter, featuring 2 fixed and 2 swivel and brake castors, with a strong 200kg total weight capacity. Constructed with a reinforced steel housing. 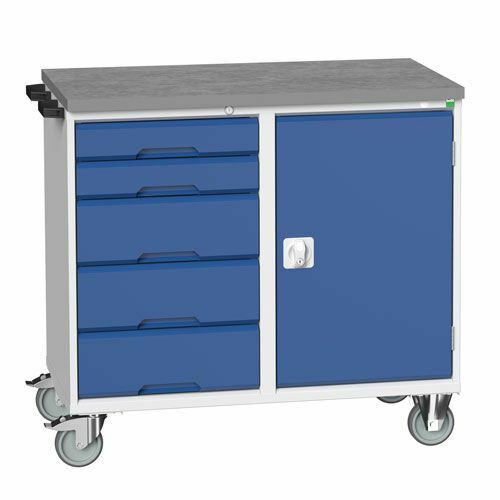 All drawers have a robust 50 kg UDL capacity and full 100% extension rollers. All cabinets are fitted with either a thick lino or multiplex worktop, to suit your business needs. Drawers equipped with blocking mechanism, to prevent more than one drawer opening at a time. Shelf is adjustable on a 25mm pitch and has a UDL of 60 kg. Hard wearing blue/light grey powder coating gives a clean and professional look. Bott Verso mobile partitioned cupboard HxW 980x1050mm promotes efficiency, convenience and mobility.